These are a couple of my latest paintings which are now listed in the Art In Wax shop to buy direct from me the artist. Postage to UK addresses is free when you buy from this website. I am happy to ship worldwide if you are happy to pay the postage and packing fees. For international sales please contact me before buying. A pretty country cottage flower painting with lots of Pink, blue, purple and Lilac shades. I have today created a slide show of some of my ACEO paintings. ACEO stands for “Art Card Editions and Originals” ACEO’s are on off-shoot of ATC (Artist Trading Cards) both of which have a long standing history. An ACEO is a miniature work of art, and can take a wide variety of styles, materials and subjects they are 2.5 x 3.5 inches in size. ACEO’s are very collectible and a popular pastime as they are an affordable way to collect art , I have sold many ACEO’s and most of these shown in this slide show are now with private collectors across the globe. I don’t currently have any ACEO in my shop by if you are interested in purchasing one from me for your collection please contact me and I will advise what I have available or maybe I can paint one especially for you as a commission. Creating these more themed shows is great fun as I look back at all my paintings and Artwork, next I will look at Landscapes and My “Ladies” to see what show will be next online. As you can see from the Art In wax website and online gallery, I love to paint flowers, plants and landscapes, I have also recently painted some fashion art, in the form of my Lady’s Day collection currently running on our online exhibits page and also some retro style dressed mannequin pictures. Mr husband Adrian is an formula one fan, has been since I have known him and during the F1 season we watch most of the races on TV so with this in mind and that fact that we have a couple of model motor racing cars in our joint office I thought I would have a try at painting a racing car ……. 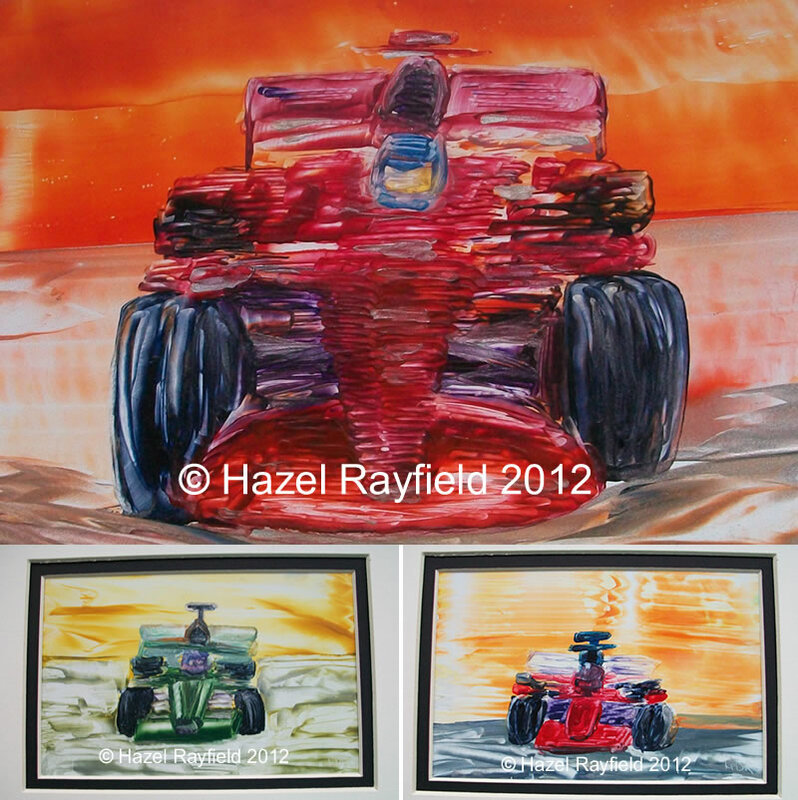 These paintings are done entirely in encaustic wax, they are in an impressionistic style to hopefully capture the feel of a racing car and have been created as a fun project and not meant to be realistic, as you can see! If you would like to purchase one of these paintings please contact me direct via the Art In Wax website. I am loving painting these small series of paintings I am doing at the moment, having just finish a set of three herb paintings for our kitchen, I was asked if I would paint some 6 x 4 paintings to be given as Christmas gifts. I have now finished the set of six paintings. Each painting is unique, three are flowers in pots / vases and three are florals : Yellow Roses, Freesia and a colourful Daisy. 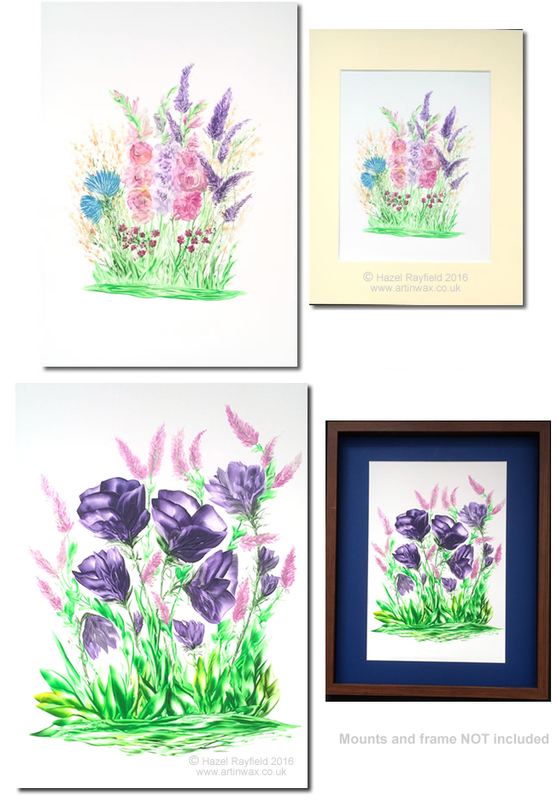 I am showing three of the paintings below these are a mix of flowers. They are to be given as Christmas presents by someone who wants to give “something a bit different this year”, she is giving each of them with a mini display easel, thus making them a bit more quirky than if they were just framed. Encaustic paintings, i.e paintings created in wax, can be displayed without framing I personally love seeing these smaller pictures displayed this way as the sheen and texture really shows. Art In Wax can also be framed and looks good in a mount and frame, it is best to keep the wax from touching the surface of the glass as this could effect the painting.